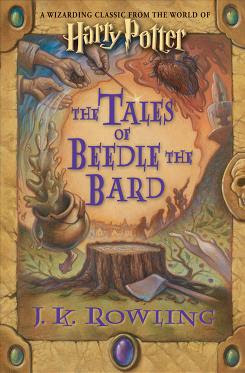 The Tales of Beedle the Bard was a pivotal plot device in Harry Potter and The Deathly Hallows. Author JK Rowling originally wrote it to thank 6 people who were involved with the HP series. Thank goodness she decided to share it with the rest of us Muggles. There are 5 stories in the JKR-illustrated book, with commentaries by Albus Dumbledore. The tales, though laden with valuable lessons about friendship, love and self-determination, are very dark and grim. I had nightmares the night I read it, so young readers beware! All proceeds go to the Children's High Level Group. just bought my copy today and can't wait to finish reading it!